Pinas Gifts delivers nationwide in the Philippines. Operates 7 (seven) days a week. We currently deliver only in the Philippines for nationwide deliveries we deliver through FedEx/DHL and LBC & our own delivery team.. Same day delivery possible within Metro Manila if you place order before 12:00 Noon (Philippine time). Order received after 12:00 Noon, will be delivered next day unless delivery date is specified. Same day or next day delivery is not possible during peak season like Valentines, Father's day, Mother's day, Christmas, New year etc. If no delivery date is specified, delivery will be in regular schedule by our dispatch department. Appliances, Furniture, some decorated cakes, and some other items require additional delivery charge & delivery time. We deliver Monday however some items are not eligible for Monday deliveries due to courier cost on Monday delivery. Additional fees may apply in some items. Disclaimer: Customer satisfaction is our goal. We always do our best to make our all items same as picture shown on this website. All items featured on this Web site represent the types of gifts PinasGift.COM offers and may vary depending upon availability. Substitutions may be necessary to ensure your arrangement or specialty gift is delivered in a timely manner. The utmost care and attention is given to your order to ensure that it is as similar as possible to the requested item. Gifts may be substituted with another specialty gift of equal or greater value and of similar theme and category if your requested gift is not available. Flowers may substitute with another color if requested color is not available. Basket, vase, bears, chocolate packets may vary and subject to substitute with size, color, shape, brand etc when original (shown our website) is not available in our stock. Take note we deliver almost all the places within Philippines but If the delivery address is far from our courier office (For provincial delivery) or not covered for delivery, recipient needs to pick up the item from our advised courier office. Recipient or buyer will be notified the advisory. Shipping charge still require whether its pick up or delivery since we ship item to your nearer courier office. Exact time of delivery may not possible since none of the couriers commit it. But delivery possible within the day as you specified. Further, you may request for morning or afternoon, evening delivery time. Pinasgift.com is not liable for any delayed delivery or non-delivery any items with or without any reason. In no event shall Pinasgift.com be liable for any direct, indirect, special, punitive, incidental, exemplary or consequential damages, or any damages whatsoever. If customer not satisfied with item for any reason, item may be replaced if recipient can send back the item as delivered within 3 working days, but cannot be refunded. Take note, listed products in our website from different merchants. If you ordered different merchants items, delivery maybe in different time but within your specified date. But in some cases we can deliver all together even you choose different merchant products, please send us request for it. Delivery time guarantee will be suspended during extreme weather such as typhoon, heavy rain etc. Incomplete shipping address might cause delay delivery! If your recipient's address is incorrect, item will not be delivered and no refund will be made. Pinasgift.com reserves the rights to cancel orders at any time. Content on this site is copyrighted including text, images, logos, design. 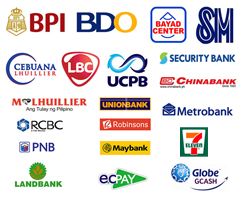 We accept all major credit cards like Visa, MasterCard, American Express, Discover Novus, Diners Club and JCB derivative of these brands. For credit cards verification we need name as it appears on credit card and the address where credit cards are sent. Ownership and Trademarks: Pinasgift.com and the website are owned by Fastnet Commu, Inc. with office at 12th floor, unit-10, Espana tower, Espana blvd, Manila city, Philippines. All the trademarks, product names, and company names and logos appearing on this Web Site are the property of their respective owners. Orders received after cut off, will be processed after the date of occasion onward and can be modified, change or cancel only within 2 hours of order placement. Afterwards order will be sent to fulfillment/processing division and cannot be changed at any form or cancel. We reserve the rights to deliver order earlier to avoid delay. Likewise orders maybe delayed in peak season such as valentines/mothers day etc. due to courier or product unavailability, we do not take any loss or liabilities for order that is delivered early or delayed.